Today is the day we get to go home!! The morning started a little rough. Charlotte woke multiple times due to her eyes bothering her. Apparently she has an infection in them and so at 4 this morning we began putting ointment on. Because she was going to be sedated she wasn’t able to eat anything until after the scan, which was at 11:00. She went down well and they said her scan went well, We still haven’t heard the results. She took a little while to wake up, but once she did, she was hungry and pigged out!! Afterwards we were rushing around trying to pack, pick up meds, and go over discharge things, we were ready to go home!! We finally get the car loaded and were expecting a 30 minute ride to the airport. The traffic was INSANE! It Took us much longer than we had hoped but we made it! The flight home was quick and boy was it nice to land in central Oregon! 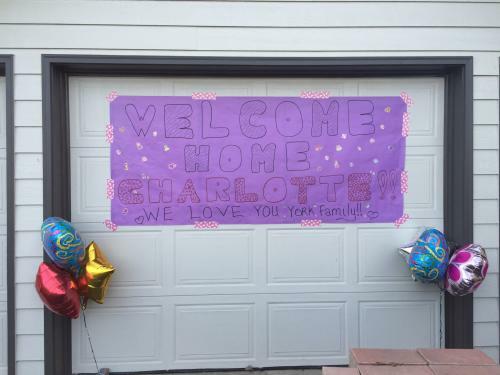 As we pulled up, there were balloons all the way down our driveway as well as all around our house with a huge banner welcoming Charlotte home. It was AMAZING! We all felt so loved by it! As we walked to the front door there were gifts waiting for Charlotte. These things just added to the excitement of FINALLY being home!